Bellatrix, I'm a Pug! : Tug it like you own it! 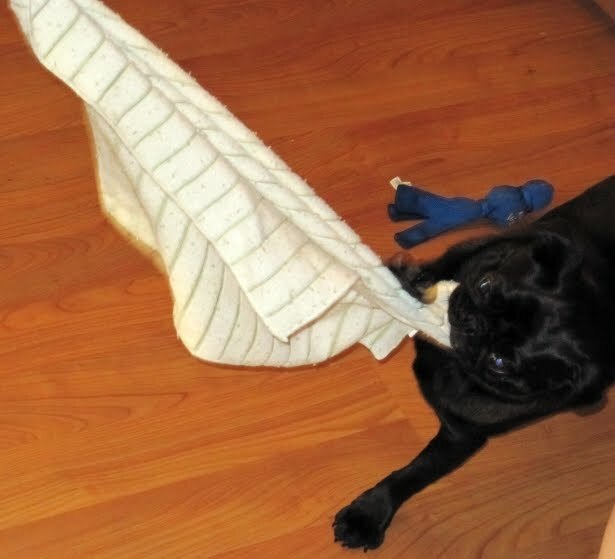 One of my favorite things to do is play tug, but it's even sweeter when dad just cleaned the floor of my jowl juice and he's bending down (this takes lots of effort he's like 10000 dog years) and I grab his towel! I am so smart, I plan it all in advance. See I orb mom "I need cold fresh filtered water" and she obliges. I get a huge mouth full of jowl juice/water combo (extra slobbery) and drip drip drip it all over the place. This drive dad insane so he grabs his "Jowl Juice towel" and follows me everywhere. I act all innocent...."Oh forgive me...am I leaking from my mouth?" then dad groans and moans and bends over and wipes. Yup folks, he actually stoops to my level with a towel to wipe....foolish move dad. I quick turn (hehehe love the flexibility of youth) and grab his towel. Oh daddy acts all put out, but I know the truth....he loves to play tug with me! See that blue toy in the background? That's my newest play toy...I'll have to blog about that at another time. Well I'm off to get more water and give dad some more gray hairs! He showed me this huge patch of gray hairs that he said didn't exist before October 14, 2009....funny that's the day I came to live here! Eh must be a coincidence. I like your attitude! Way to control the parents. I love,love.love JOWEL JUICE. It just cracks me up. My Dad's face fur keeps getting whiter and whiter. I get the blame for that too! "I orb Mom.." hee hee. That's funny. You do have some dangerously cute orbs. And you totally work 'em. We should send Dutch to live with you. His mouth turns into a faucet when my human pours his food. Giant streams of drool pour out and leave goopy puddles on the floor. Drives my human nuts. Great shot of your jowling capabilities!! I wish we could have gone jowling tonight Bells! Hey Belly!! It's Me's!! Anakin Man!! I've come over to visits!! Yousa looks sooooo funnies pulling 'dat towels from your Daddy! Hu Hu's! Silly, Silly 'renty rents!! My Daddy always follows me's arounds too wit a wash clothes to wipes me mouths. No sooner does he go to wipey wipes do I's slobby everywheres!! Teach him to be all ups in my personal spaces on stuffs!! I's like you new blue toy!! I's can't wait to hears 'bout its!! Oh's it's good to be backs! Belly Belly Bo Belly... Banana Fanna fo felly fee fi fo felly Ba ba ba BELLY!! !